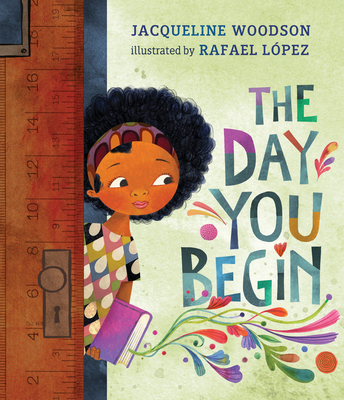 National Book Award winner Jacqueline Woodson and two-time Pura Belpré Illustrator Award winner Rafael López have teamed up to create a poignant, yet heartening book about finding courage to connect, even when you feel scared and alone. There are many reasons to feel different. Maybe it's how you look or talk, or where you're from; maybe it's what you eat, or something just as random. It's not easy to take those first steps into a place where nobody really knows you yet, but somehow you do it. Jacqueline Woodson's lyrical text and Rafael López's dazzling art reminds us that we all feel like outsiders sometimes-and how brave it is that we go forth anyway. And that sometimes, when we reach out and begin to share our stories, others will be happy to meet us halfway. Jacqueline Woodson is the is the 2018-2019 National Ambassador for Young People's Literature and received the 2018 Astrid Lindgren Memorial Award and the 2018 Children's Literature Legacy Award. She is the 2014 National Book Award winner for her New York Times bestselling memoir Brown Girl Dreaming, which was also a recipient of the Coretta Scott King Award, a Newbery Honor, the NAACP Image Award and a Sibert Honor. She receive the Jane Addams Children's Book Award and is a four-time Newbery Honor winner, a three-time National Book Award finalist, and a two-time Coretta Scott King Award winner. Her books include The Other Side, Each Kindness, Coming On Home Soon, Feathers, Show Way, After Tupac and D Foster, and Miracle's Boys. She received the Margaret A. Edwards Award for lifetime achievement for her contributions to young adult literature. Rafael López won Pura Belpré medals for Drum Dream Girl and Book Fiesta, and has also received three Pura Belpré honors, two Américas Book Awards, and the 2017 Tomás Rivera Children's Book Award and Society of Illustrators Original Art Silver Medal. His work has been featured in Communication Arts, American Illustration Annual, Graphic Design USA and Huffington Post. He's a founder of San Diego's Urban Art Trail movement, created seven US Postal Stamps, and created official posters for the '08 and '12 Obama-Biden campaigns.